ABC Action News is looking into the number of traffic signals that need to be installed on roads across Hillsborough County, especially in the southern part of the county. We found there is a list of lights that could take years to complete as there are nearly two dozen in the planning and design phase in the county. In total, there are 22 that are in that phase and they are across Hillsborough County in areas like Bruce B. Downs, and Gunn Highway. However, marjority of those lights in planning are in the Lithia, Valrico, Riverview areas. To see a full list of expected lights, lights under construction and completed project, click here. As part of our commitment to Driving Tampa Bay Forward we're looking into tips from viewers about a problem intersection in Riverview that is currently a four way stop. Balm Riverview and Rhodine Roads are two lane roads that many drivers use to get out of subdivisions in the growing part of the county. ABC Action News found that since 2013 the number of lights that have been put in by the county and FDOT have dropped dramatically in Hillsborough. In 2018, there were 3 traffic signals installed, and one temporary light. 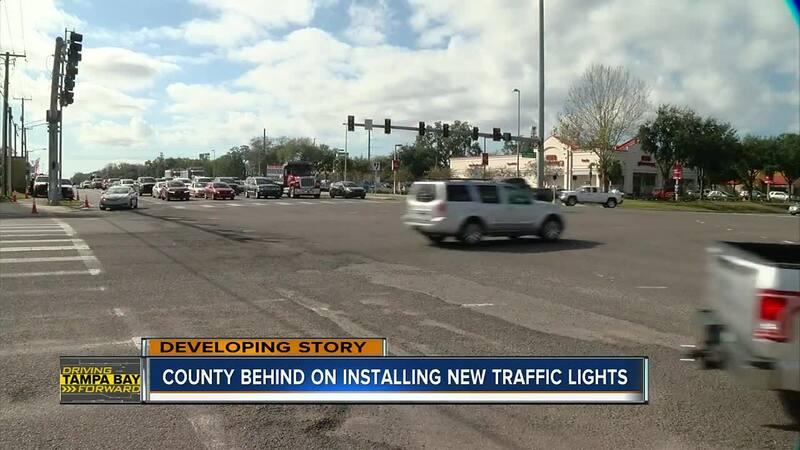 Those lights that were completed in 2018 are in different areas of Hillsborough County, and only one is in that south county area. Those new lights are located: Orient Road at the Seminole Hardrock Casino entrance, Hillsborough Avenue at Fire station #32 (Harney Road), 78th Street at Camden Field Parkway and Gibsonton Drive & Fern Hill Drive (temporary construction). ABC Action News has reached out to the county, and were waiting for their official response about the decrease in traffic signals going up and those on the list.